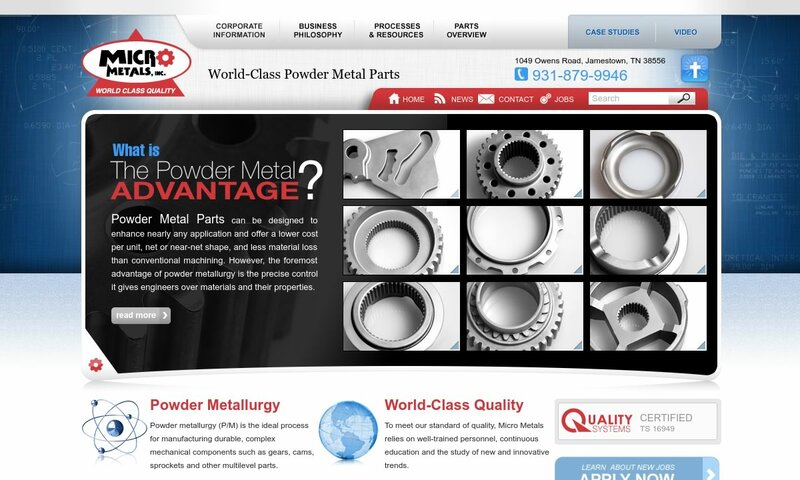 A reliable source for Powdered Metal Parts information and a resource for accessing leading Powdered Metal Parts and suppliers. Powdered metal parts are parts made from powdered metal via powder metallurgy. Manufacturers turn to powder metallurgy in order to cost-effectively fabricate precision parts. With powder metallurgy, they can carefully control elements like porosity, shape and design. Powdered metal parts offer some of the tightest tolerances on the market. Powder metal is soft and can be formed in a variety of shapes with proper sintering. Powder metal is a popular choice of material for parts with magnetic properties, and its magnetism can be enhanced through the sintering process. 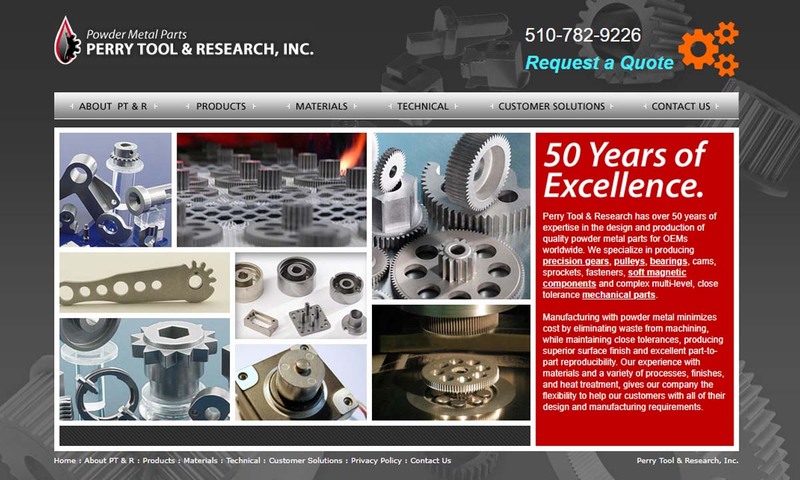 Since 1962, Perry Tool and Research has manufactured complex powdered metal parts with premium surface finishes and long life cycles. Our powder metallurgy production processes ensure close tolerances and repeatability. 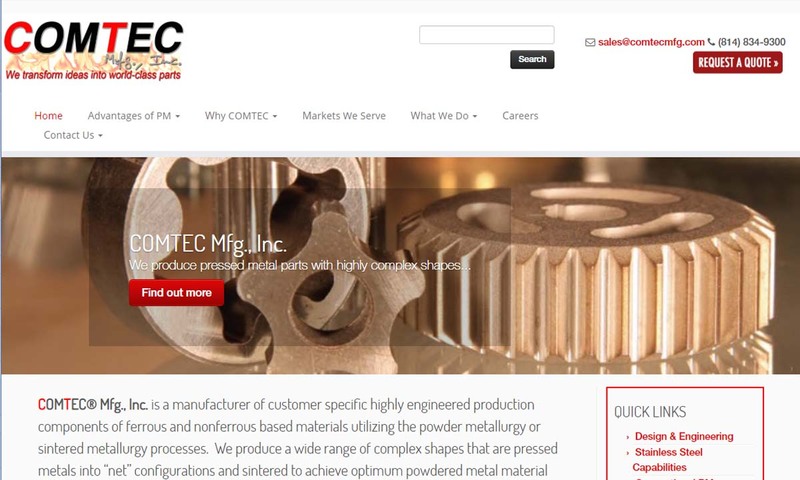 Comtec was established in 1987, and manufactures components of a wide range of configurations from ferrous and nonferrous based materials. 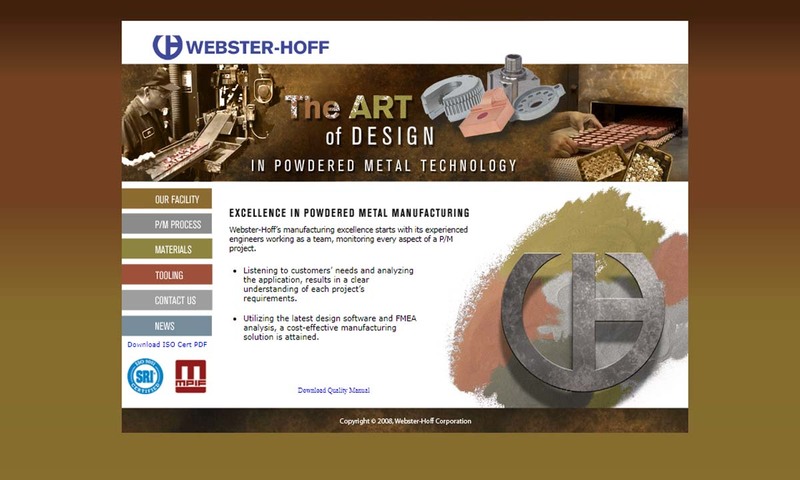 At Webster-Hoff, we value quality in manufacturing powder metal parts and customer service. 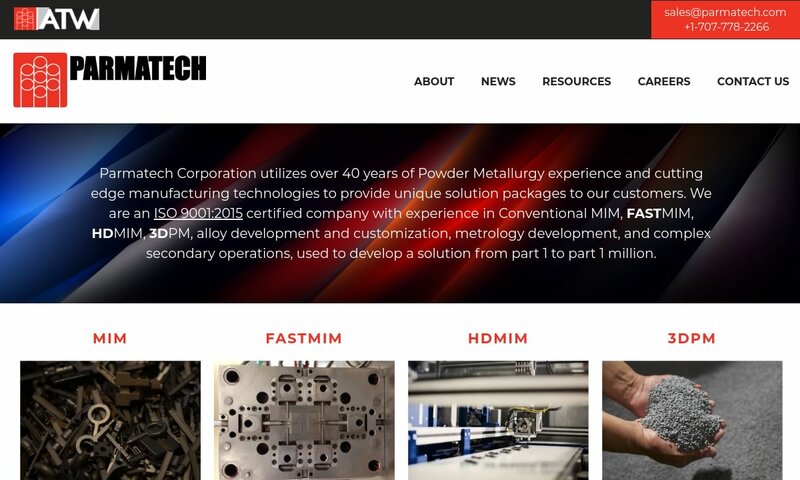 Our engineers have the skills to analyze the demands of our customers and utilize our state-of-the-art equipment to manufacture their desired powdered metal products. 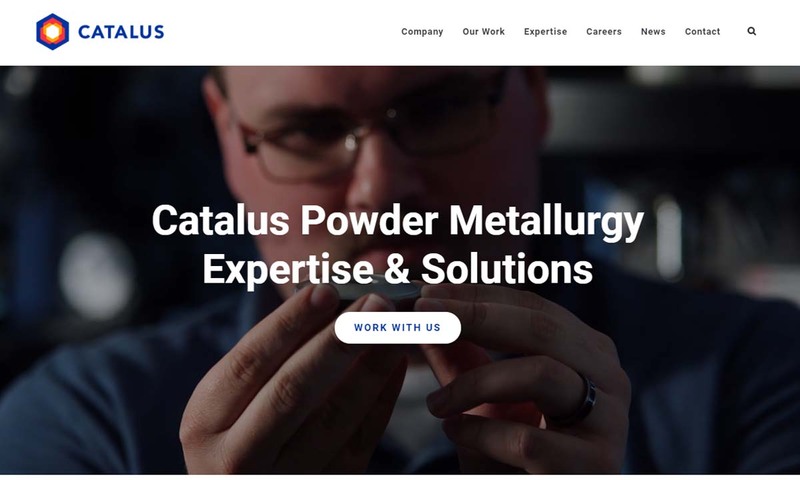 Catalus Corporation, formerly SMC Powder Metallurgy Inc., is a manufacturer of powder metal parts. Our line of products include armatures, magnetic poles, contacts, and more, which we can produce from materials like bronze and brass. atwcompanies.com Phone: 800-709-1555 Fax: 707-778-2262 Geo Location Marker 2221 Pine View Way Petaluma, CA 94954 View Map Parmatech is an ATW company and the leading supplier of custom manufactured Metal Injection Molding (MIM) components since 1973. The low cost, high volume manufacturing process produces metal parts to near net shape, reducing or eliminating the need for secondary and machining operations. Established in 1976 we have made it our goal to provide our customers with high quality, economically viable products while maintaining our moral and ethical values on which we were founded. Powder metal parts include magnetic assemblies, filtration systems, structural parts, sharp gemstone grinding blades and auto metal components like powder metal gears, bearings and bushings. Powdered metal is also popular as a finishing coating for products that need to endure harsh climates and heavy industrial usage. In addition to increased corrosion resistance, powder coatings can create a desired surface aesthetic or texture. The process of creating powder metal parts, powder metallurgy, did not become common until after the Industrial Revolution. However, in some form or another it has been in use since at least 3000 BC. The Egyptians offer us examples of some of the earliest powder metal parts and they sintered items using powder iron. By around 300 BC, the Inca living in present-day Colombia and Ecuador were sintering jewelry and various practical objects (e.g. fish hooks) from powdered precious metals including gold, silver, and platinum. After a period of declined use, people began using powder metallurgy again in the 1800s. First, engineers used powdered platinum to fabricate lab instruments. Next, in the service of Thomas Edison, William Coolidge designed a lamp filament that called for sintered powdered tungsten. He later used tungsten powder to create fibers for brighter electric lamps. Powdered metals really began to come into their own in the 20th century, starting with the mass production of lightbulbs, followed by the invention of welding. Powder metal parts also proved indispensable in the new industries of aviation and automotive manufacturing. By the 1930s, engineers were making powder metal bearings, powder metal electrical contacts and cemented carbides. By the 1940s, they were making metal powder refractories and powder steel. During World War II, powder metallurgy reverted to being used for only major products, automotive self-lubricating gears. In 1944, to streamline and legitimize the industry, several manufacturing companies got together to form the Metal Powder Association, or MPA, which later became the Metal Powder Industries Federation, or MPIF. With the formation of the group, new manufacturing groups were able to learn about powder metallurgy and expand its uses. Today, powdered metal parts are still quite popular and are used in more industries than they were at their inception. Manufacturers can even incorporate powder metal parts into biomedical implants. Bronze, steel, iron, brass, copper, and aluminum are just a few of the many metals that can be converted to powder and undergo the metallurgy process. The sizes of these powder materials are categorized by mesh powder, which is a measure based on the size of mesh openings through which the powder can pass. Aluminum is frequently used because it is highly flammable, highly conductive, and light in weight. Aluminum is a popular material to use in structural applications and pyrotechnics. Copper is highly conductive both electrically and thermally and is popular for use in electrical contractor or heat sink applications. Iron contains a graphite additive and is frequently used to fabricate bearings, filters, and structural parts. Steel, used for tool steel or stainless steel powders, is very high in strength. One of the applications for which it is frequently used is automobile weight reduction. Bronze is a metal that is higher in density and has a higher mechanical performance than brass. Bronze metal parts are commonly utilized to fabricate self-lubricating bearings. The creation of powder metal parts (powder metallurgy) involves three main steps: powder formulation, pressing, and sintering. Sometimes, the product also requires secondary operations, such as machining, deburring, sizing, or heat treatment. During this part of the process, manufacturers take raw metal material and make it into powder by way of atomization, mechanical alloying, electrolytic techniques, chemical reduction, and pulverization. They then mix the powder with a lubricant, which helps reduce friction between the powder material and the pressing dies. The next step involves forming, in which the material is molded, forged, or pressed. During the high-temperature process of sintering, manufacturers take the compacted raw materials, also known as green parts, and melt them down in a furnace. When the green parts are melted, the particles are bonded together while still retaining the part’s shape. The finished parts may appear solid, but they are actually made up of tiny capillaries that are interconnected with each other. Thus, the parts have a porosity of 25%. During the design of powdered metal parts, manufacturers consider application specifications such as desired shape, desired size, complexity of shape, application environment (temperature, abrasion, corrosive substance exposure, etc. ), frequency of use, required material properties, and product volume. Using these considerations, they put together a plan regarding the metallurgy process, material composition and mold design. For your convenience, metallurgists can offer some customization. For one, they can alter material composition during the powder phase so that it exhibits more of the qualities you need (e.g. tensile strength, corrosion resistance, solvent resistance, etc.). They can create custom molds and will only manufacture parts that can meet any and all standard requirements. Some machinery used during powder metallurgy are pressing dies, continuous belt furnaces, and standard plastic injection molding machines. Pressing dies are used to compress and shape powder metal components. The pressing die is usually made from steel or carbide. Continuous belt furnaces are common components of sintering. Their job is melt and fuse the powdered metal mix into a solid piece. Also, they make sure that the newly compressed metal powder is evenly and thoroughly heat treated. Standard plastic injection molding machines are used during metal injection molding. They are generally equipped with CNC programming. CNC molding machinery has greater precision, more uniformity, higher efficiency, and lower secondary costs. The two main processes manufacturers use to make powder metal parts are sintering and metal injection molding. To a lesser extent, manufacturers also use powder forging and powder spraying. Sintered metal products have many advantages over parts that are fabricated through other processes. Sintering uses roughly 97% of materials, and therefore does not produce as much waste. Sintered products are not sensitive to the shapes in which they are formed, and they frequently do not need to undergo any secondary operations. A few great examples of components that work best when sintered are metal gears, bearings, and bushings. Powder metal gears are inherently porous and they naturally reduce sound, making them a suitable component to the sintering process. Bearings and bushings can be sintered, though they may require a secondary sizing operation because their fabrication leaves little room for error. Metal injection molding is a powder metallurgy process that combines powder metallurgy and plastic injection molding. In short, the metal injection molding process involves adding wax, resin, or polymers to powdered metal, heating the mixture to a pliable state, and formed within a mold. When manufacturers use metal injection molding, it goes before the sintering step. Also, during this process, they only use standard plastic injection molding machines. During metal injection molding, the first step is to mix the metal powder not only mixed with lubricants, but also with thermoplastic resins. After mixing the powder metal, manufacturers use chemicals or thermal energy and an open pore network to remove the thermoplastics from the parts. Finally, they put the parts through sintering and, if necessary, secondary procedures. Manufacturers frequently use metal injection molding to produce metal parts that are smaller, more complex, high density, and higher performing. Examples include parts used in industries such as electronics, computer, hardware, firearms, dental, medical, and automotive. Metal injection molding allows for more freedom in detailing and design, reduces waste, and offers products that are magnetic, more corrosion-resistant, stronger, and denser. However, this process is only used in making thinner, smaller parts, and is more costly than regular powder metallurgy. During powder forging, manufacturers apply intense pressure to the powder in order to compress it. Then, they insert it into a die and apply heat. Metal forged parts are especially strong. During powder spraying, manufacturers take powdered metal, melt it, then atomize it. They then spray the atomized droplets onto a preform. This variation is used to create powder metal products such as cladding. The powder metallurgy process and powder metal parts offer many advantages. First, it is highly efficient. This is especially true because it is automated. Second, it is low cost. In addition, the process creates little waste. Another great benefit of powder metallurgy is the fact that it can create such uniform and well mixed metal parts. Powder metal parts have controlled porosity, enabling them to self-lubricate and filter gases and liquids. Powdered metal parts can be very complex while maintaining close tolerances. For that reason, powder metallurgy is a highly recommended process in fabricating parts that require intricate bends, depressions, and projections. Finally, powdered metallurgy is versatile. Metallurgists can use a wide variety of composites, alloys, and other materials during the sintering process to fabricate products of numerous designs and shapes. If you are interested in ordering powder metallurgy parts, you need to consult with an experienced manufacturer. To help you on your way, we’ve put together a list of those powder metal parts manufacturers we trust. You will find their profiles cushioned in between these information paragraphs. Before you check them out, we recommend you create a list of your application specifications and your questions. Make sure to include things like your budget, your timeline, any standard requirements, and your custom requests. Once you’ve got your list together, you can begin to browse. As you look over their services, double check your list. Pick three or four that appear to be good fits, and then reach out to them. Discuss your application at length and don’t be afraid to ask questions! Take notes as you speak and once you’ve spoken with each of them, compare and contrast your notes.  Determine which manufacturer is right for you, then get started. Good luck!